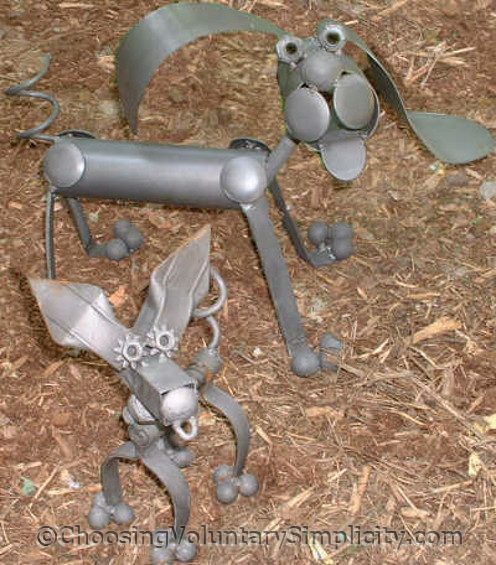 These dogs are made of various springs, bolts, nuts, and pieces of metal welded together, and the metal is supposed to rust over time as the dogs are exposed to the elements. What I thought was so amazing about these dogs is how expressive they are. Although the design is crude and they don’t look like actual dogs, the way the metal pieces are put together somehow gives each one a unique personality. They look really cute in the garden. What precious garden dogs…..so much expression….. I love these!!!! I have been wanting to make a pig out of an old milk can and other metal parts. Your dogs have inspired me to get started on this project. I love those! They won’t rust, will they? Yes, the dogs will rust. Actually the tag said that they are supposed to rust and that they are made of metal that will rust easily. They had one in the display that was rusted all over, and it really looked even cuter. 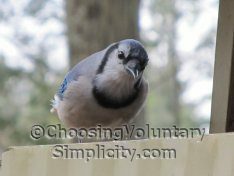 Joyce… I think I actually have seen a pig like the one you want to make, if you’re talking about the old-fashioned milk cans that they used to haul milk to the creameries. The pig was awfully cute. Good luck with your project. How are the pieces fastened? I know you said welded, but do you think they could be bolted or screwed instead? I have no idea how to weld anything. My wife saw your pictures and she wants me to make some for her. Stephen, I have e-mailed you some close-up photographs of how the metal pieces are joined. I hope this gives you some ideas but my husband seems to think that you wouldn’t have any trouble fastening the pieces with bolts or screws. I’d love to see pictures of your finished dogs. Very cute sculptures. If you don’t want the metal to rust, you can coat it with Everbrite Protective Coating.